With Valentine’s Day right around the corner, you may be busy thinking about what special meal you will prepare for your sweetheart, or when to pick up those dozen roses. Don’t worry, you’ve still got time! But there is someone else who could use a little love – your refrigerator. Your fridge keeps your milk perfectly chilled and your vegetables frozen for you all year long. This is probably the last appliance you want to break. By taking a few minutes a few times a year to do these simple tasks, you can improve the lifetime of your refrigerator and avoid unnecessary repairs. Take a look at the inside of your fridge. You should be regularly wiping down the inside, but every once in a while give the bins, selves, shelf end caps, and retainer bars a closer look. Also check any glass shelves, crisper drawers and drawer slides. Look for anything broken, cracked, unstable or defective. As soon as you notice any of these problems, you’ll want to replace of fix it to prevent any further damage that may be caused by a falling shelf of food. Next, take a look at the seal, or gasket on the refrigerator. It is the vinyl strip that forms a seal between the cabinet and the doors. It keeps the fridge running efficiently by keeping room-temperature air out, and chilled air in. You can perform a simple test to check the seal by shutting a dollar bill between the seal and the door. Once the door is shut, pull the dollar bill out of the fridge door. If there is tension when you pull, you’ve got a good seal. Try this test in several different spots along the seal. If this little test proves your seal is lackluster, it may not be flexible enough. Try massaging a vinyl conditioner or a thin film of petroleum jelly to loosen up the seal. Also, be sure to wipe up any spills before they stick and cause the seal to tear. This will also maintain flexibility and prevent odors. If you notice the gasket is loose or torn, it’s time to replace it. This can be tricky to do, so be sure to call Complete Appliance Repair to do the job right. The inside of your fridge isn’t the only place that needs to be maintained. For starters, the hinges get plenty of action every day. Which is why it’s important to make sure the hinges are in good shape and have proper lubrication. Wear and tear is normal, but occasionally using some food-grade lubrication on the hinges and checking for any damage on the top and bottom hinges will prolong the overall life of your fridge. You can also help your fridge stay efficient by removing any dirt, dust, and hair that often collects on the condenser coils and condenser fan. Cleaning the condenser coils and fan can also maintain proper airflow. To clean these parts, you should first make sure that your refrigerator has been unplugged. The condenser coils are usually located at the back or the fridge or across the bottom. If the coils are at the bottom of the fridge, it’s likely the fan will be there too. To clean, remove the back panel of the refrigerator. Then with a vacuum and soft brush, remove any buildup. Do this carefully and avoid damaging the coils or fan. Occasionally taking the time to maintain your refrigerator will help you avoid any unnecessary repairs, and it will also help you catch those repairs that are important to address without delay. 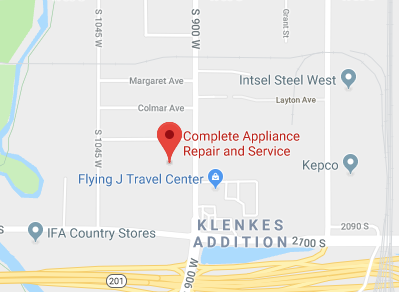 If you have any questions about your refrigerator or other appliances, be sure to call Complete Appliance Repair. This entry was posted in Blog and tagged appliance repair, Appliance Repair Salt Lake City, Love, Refrigerator Repair, Utah, Valentines Day on February 9, 2016 by admin.